Every couple of hours from Monday to Saturday, the rusty boat slips out into the dark waters of Loch Linnhe leaving behind the cars bustling along the lochside road. As you head towards the hills of the Ardgour peninsula and alight at the pier at Camusnagaul, you've already made a firm step away from civilisation and towards wilderness. Despite being so physically close to Fort William, the Ardgour peninsula feels immediately remote and cut off and you can't help but feel slightly nervous as you strike off on the first steps of this epic journey. Counterintuitively you start your journey to the most north westerly point of the British Isles by heading almost due south. You could choose instead to follow the A861 road north and west around the shores of Loch Eil (it's probably the quietest A road you'll encounter), but it seems a shame to skirt the rugged inner beauty of the peninsula. So instead, the main route initially follows the road south along the shores of Loch Linnhe before turning inland along a wide 4x4 track up Cona Glenn. There is an estate bothy here but it is generally locked. There are many good camping spots further along the glen. At just over 20 miles, this is a long first day if tackled in one go, so you may choose to ease yourself into the walk and camp short of Glenfinnan. The next leg to Glen Dessarry is shorter, so would be easily doable in a day, even with some additional distance. From Cona Glenn the path turns north and climbs over the shoulder of Meall na Cuarcaige before descending past a power station and swinging west to the Glenfinnan monument that guards the northern end of the serpentine Loch Shiel. Glenfinnan itself has a couple of hotels, and slightly further up the glen is a well kept estate bothy at Corryhully, which even has electricity. Even further up the glen, good camping spots can be found by the River Finnan. An alternative start to the Cape Wrath Trail was suggested by Cameron McNeish. However, the start of this variant could scarcely be less prepossessing, which is the primary reason it isn't suggested as the main route. However, it is an easier start on the legs. You can check out the route on an Ordnance Survey map here. As you cross the supermarket car park, the most pressing danger is being mown down by frantic shoppers jockeying for parking spaces. The first three miles are also pretty grim, as the route snakes out of Fort William along the Great Glen Way, through a housing estate and along a grubby shoreline towards Banavie. 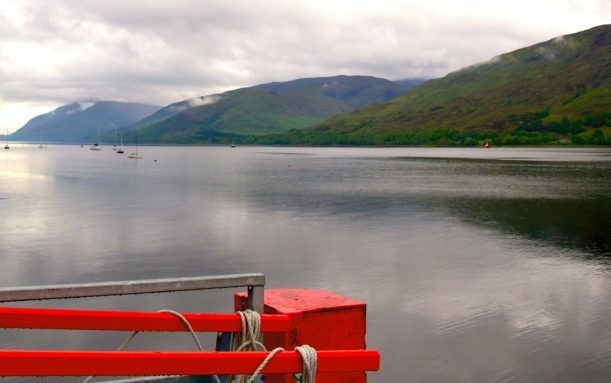 If you're not a purist, you might decide to start your journey from Banavie itself (one stop from Fort William on the train), where Neptune's Staircase, an impressive series of eight locks, brings Thomas Telford's Caledonian Canal 18 metres down to sea level at Loch Linnhe. From there on the going gets better as you follow Loch Lochy and pass by Invergarry into the beautiful Glen Garry before traversing the spectacular Glen Loyne to Cluanie. The route heads north towards the hostel at Alltbeithe. From here you have a couple of choices to rejoin the main route. You could head west along Fionngleann and Gleann Lichd to Morvich or take the spectacularly wild route northwest along Gleann Gniomhaidh turning north along Gleann Gaorsaic to Carnach. Either is superb - this is wonderful country.